A pinch of this & a dash of that. We are only three days into the new year and we have already seen our first blizzard! With temperatures falling into negative digits today, I decided it was time to share a warm and tasty dessert that will help make you forget about all that snow piling up outside! Combing through my pantry after the holidays I always seem to find a random can of this and that, that never got used during my holiday baking. Today it was the giant can of pumpkin puree that I skipped over during Thanksgiving. I know the “pumpkin everything” season has ended at our local coffee shops, but that doesn’t mean that I am quite ready to give it up completely. 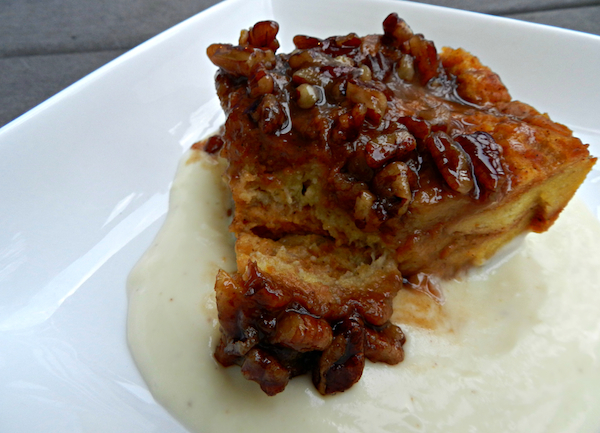 This weather is perfect for a hot pumpkin bread pudding and why not add a Jameson-spiked whiskey sauce? It is a snow day after all. 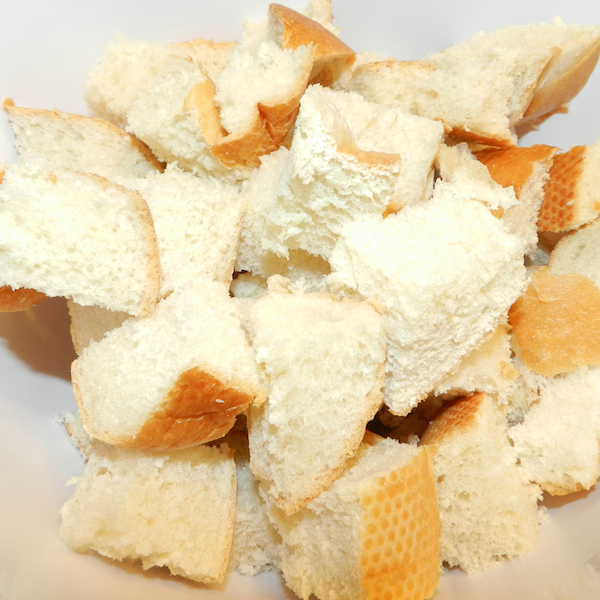 Cut the French bread into 1 inch pieces and set aside in a large bowl. In another large bowl, whisk together eggs, pumpkin, milk, half & half, sugar, salt, cinnamon, nutmeg and vanilla, until well blended. 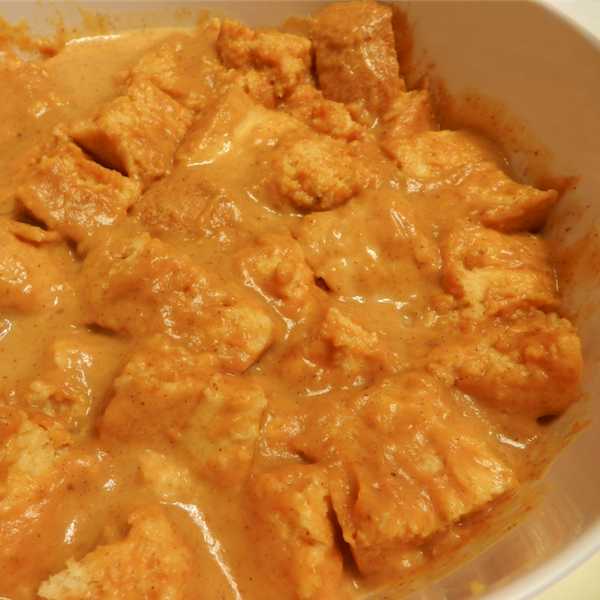 Pour the pumpkin mixture over the bread and stir to coat evenly. Cover will plastic wrap and let chill for 8-12 hours. Waiting 8 hours might seem like torture once you smell this, but you can do it! Preheat oven to 350 degrees. Spoon chilled bread mixture into a lightly greased 13×9 inch baking dish. Cover with foil and bake for 35 minutes. Remove the foil and bake an additional 15 minutes. During the last 15 minutes of baking, prepare the pecan-caramel sauce. Heat the pecans in a skillet over medium-low heat, stirring often, 3-5 minutes or until lightly toasted and fragrant. Cook brown sugar, butter and corn syrup in a small saucepan over medium heat, stirring occasionally until sugar is dissolved, about 3-4 minutes. Remove from heat and stir in vanilla and pecans. 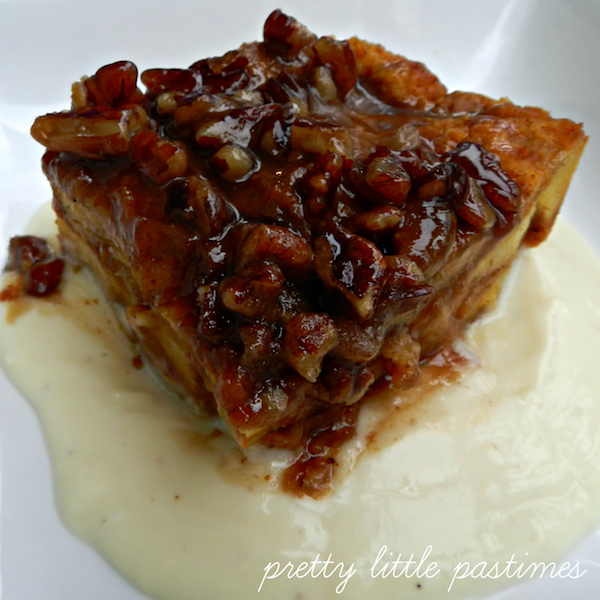 Remove bread pudding from oven and drizzle with the Pecan-Caramel Sauce. Return the dish to the oven and bake for 5 minutes longer or until sauce is thoroughly heated and begins to bubble. Now it is time to make the whiskey sauce. Pour the milk into a saucepan and add the nutmeg. Scrape the seeds from the vanilla bean add to the milk with the bean. Heat gently until small bubbles appear around the edge of the saucepan. Set aside to cool, then strain the milk and discard the bean. Melt the butter in a saucepan over low heat. Sprinkle the flour over the butter and cook, stirring continuously with a wooden spoon for 1-2 minutes. Be careful not to allow the mixture to color. Remove from heat and slowly add the vanilla milk, whisking vigorously to avoid lumps. Return to low heat and bring to a boil, stirring constantly. Add the sugar and simmer for 3-4 minutes. In a bowl, stir together the yolks and milk. Pour in a quarter of the, now hot, sauce, stir together to blend and return the mixture to the remaining sauce in the pan. Add the whiskey and stir constantly over medium-low heat until heated through, without allowing the sauce to boil. Finish by straining. While everything is still hot, spoon a portion of the whiskey sauce onto the bottom of a plate. Layer the bread pudding directly over the sauce and, if desired, top with fresh whipped cream. This recipe might not shovel your driveway, but it will help make this bitter-cold weather a little more bearable. Now, curl up under a big blanket on the couch and enjoy! Hello there! I'm so glad you stopped by.